Dollars into Sense: Pressing the financial reset button: When bankruptcy becomes your only option. 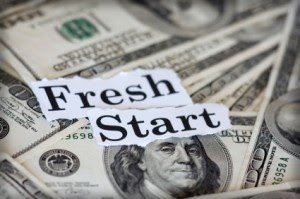 Pressing the financial reset button: When bankruptcy becomes your only option. This year may go on record as the one during which the recession officially ended. But the effects are clearly still being felt: More personal bankruptcies are projected to be filed since 2006; a year after new laws went into effect. And responsible consumers – people who pay their mortgage on time and save for retirement – are losing the most in the process. By the end of the year, more than 1.6 million people are expected to have filed for personal bankruptcy, according to the American Bankruptcy Institute. Almost 65% of filers chose “income reduction” as a reason for filing, while 42% listed “job loss” as a reason (debtors can choose more than one). For those who have suffered job loss, have been hit hardest by the worst economic recession the U.S. has experienced in decades or for those who simply got in over their head and bit off more than they can chew: Bankruptcy is the only option they have to get their life back on track. I personally know clients and friends alike who have filed for bankruptcy in the last 2 years alone and have been far better off after doing so. I even accompanied a good friend of mine to their attorney’s office for moral support when they filed, and at one point I, myself considered it to be a very tempting option. Being deep into debt can have a very Sisyphean affect on your daily life. Each day you roll a bolder up a mountain of debt with the illusion of progress only to start all over again when a new month begins. Before you decide to stop throwing good money after bad, you need to seek the professional advice of a Bankruptcy Attorney (most have flat rates and will take payments in installments) to see which chapter of bankruptcy is right for you and what assets you want to protect. Who it’s for: People who have no assets, like a home or car, to lose — or who have just enough to cover daily expenses (or less) but no extra for a payment plan. How it works: Non-exempt assets are sold, proceeds are given to creditors and most debts are forgiven. Who it’s for: People who are trying to hold on to their assets and who also make enough money to cover daily expenses — with a little left over to pay creditors a reduced amount. How it works: A payment plan is set up through the court, but usually for less than the amount owed. Payments are made over a three-to-five year period, and must equal at least the amount of money creditors would have received if you filed Chapter 7. Holding on to your home depends on the state you live in and the equity in your house. Florida residents can keep up to 160 acres outside of city limits and the home that’s on it, or up to half an acre and a home in cities. Texans can protect up to 200 acres of rural property or up to 10 acres in the city. And in general, if a home is worth less than the mortgage balance – that is, the owner has no equity – the owner can keep it as long as the payments stay current. For filers who do have equity, most states offer an exemption — money from the trustee’s sale of the home that stays with the homeowner. But over that amount, every penny of a sale is applied to outstanding debts and paying the trustee. In California, for example, the equity exemption is up to $175,000, but other states are far less generous: In Ohio, the state exemption for a home is up to around $45,600 if married or up to half that for singles. In Tennessee, the exemption is as much as $12,500 for singles and up to twice as much for couples. Most tax-exempt retirement funds, like 401(k)s and individual retirement accounts, are out of reach from creditors. IRAs are protected up to about $1.17 million per person. Holding on to a car depends on several factors, including what’s covered by state exemption. In general, as with a house, owners who owe more than the value of the car can generally keep it, as long as payments stay current. Free-and-clear car owners can keep a car if it’s worth less than the state exemption, but drivers who have a car loan and some equity in their car can see their vehicle seized and sold, and recoup only their equity up to the exemption. Delaware and Nevada grant the most generous exemptions for cars, each up to around $15,000. In the 16 states that follow the federal exemptions, including Connecticut, New Jersey and Pennsylvania, the federal car exemption is up to about $3,450, but bankruptcy filers can also to dip into the federal “wild card” of up to roughly $12,000 to keep the vehicle. Married couples who jointly own the car can claim a federal exemption of up to $30,900. One of the strictest states is Florida, where the exemption is capped at $1,000 and there’s a wild card option of up to $2,000 per person, assuming the couple hasn’t claimed a homestead exemption. Term insurance policies are safe after bankruptcy, but whole-life insurance policy holders aren’t always so lucky: These policies are considered an investment vehicle. Depending on the state, there could be exemptions – Florida protects the entire policy, other states only protect a fraction. And in Ohio, life insurance policies remain intact when the beneficiary is a dependent; otherwise, there’s no exemption, and the state's wild card is around $1,075 per person. The fate of the balance of a 529 plan depends on several factors. If a 529 plan is less than two years old, protection is limited to $5,000; creditors can take what’s been saved beyond that. The same mostly holds true for a Coverdell account. But after that two-year period, the plan is safe, as long as the person filing for bankruptcy is not the beneficiary; the account is not safe if the beneficiary is not the child or grandchild. If the filer is the beneficiary — for example, a 30-something with leftover college savings earmarked for grad school — trustees could cash out the 529 plan to pay creditors. Filing for bankruptcy should be looked at as a last resort and not as a free pass. Regardless of which chapter you are filing for, a FICO credit score will take the same hit — a reduction of up to 240 points for a borrower with a score of 780 and a reduction of up to 150 points for a 680 scorer. Which means, anyone filing for bankruptcy will most likely spend the next 3-5 years rebuilding their credit, which can make qualifying for loans with low interest rates, credit cards and other financing next to impossible. You need to plan ahead and make sure that you do not need to finance anything before you file, or you can get someone to co-sign for car loans or rental lease agreements. Bankruptcy was designed to help people get off the financial treadmill and back onto solid ground, the number one lesson anyone should take away after filing “BK” is to not make the same mistakes again. Thanks for sharing good and informative knowledge which helps the people to regain and help to sort out problems regards to Bankruptcy.Write is so impressive and helpful.Post explain all the aspects which are directly and indirectly concerned with bankruptcy and debt. Thank you for reading my blog bankruptcy credit report, and thank you for your wonderful compliments. It's refreshing to read a blog post about bankruptcy from someone who actually knows what they are talking about. My own bankruptcy was discharged in 2009 and I am flabbergasted by the sheer volume of misinformation that internet marketers are posting. I would like to caution anyone who finds themselves in the unfortunate situation of having to file bankruptcy, to speak to a bankruptcy attorney. However, I also encourage them to appreciate your post as dead on. Thank you epiphany for taking the time to read my blog your viewership and compliments are both very much appreciated. Now that your bankruptcy is behind you, I hope that you have been able to move forward by leaps and bounds. I am in a chapter 13 bankruptcy in Nevada and am trying to figure out if the money I have received being a beneficiary (life insurance) from the recent death of my father will be taken by the trustee. Thank you for blogging in such an understandable way, it has been very helpful. Thank you for blogging in such an understandable way, it has been very helpful. I'm glad you found it helpful Danial, thank you for visiting my blog. We dispel the most common myths about bankruptcy and warn you about bad credit counselors and about the various scams people use to take advantage of people in financial distress. Thank you for stopping by Helena. Great information regarding life insurance, thank you very much. Thank you for stopping by, please come again soon. Debts are made to be paid. This is applicable to all debts like car loans, housing loans, payday loans and more. It is the responsibility of the debtor to pay his debts. However, there are instances wherein an individual experiences financial difficulties. If you think you can't help it anymore and debts are giving you too much burdens, then you need to get a lawyer that will help you in filing for bankruptcy. This will give you financial freedom and peace of mind. Thank you for stopping by and visiting my blog Sharon. Hope you come back soon. Once they recognize their situation, and once they decide that it will be difficult or impossible for them to change their financial position, then they must seek help. They will go to a bankruptcy attorney.